I like the writing and I’m all for character driven stories. Sounds like a fun series. Welcome. Always nice to meet someone new. Hope you enjoy being a part of the meme. Thanks for visiting Lorraine I shall go and check yours out next. 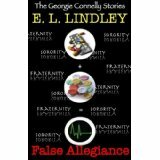 The focus of False Allegiance is on the frat and sorority houses on a college campus and what is coming out in the story is how perhaps the students allegiances are not in the right place. I take it they are often up to something. 🙂 I haven’t heard of Georgie or this book. I love mysteries. Thank you for sharing! You’re welcome, thanks for stopping by and commenting. Actually they aren’t – at least not what it sounds like they might be up too! I think it’s a good sign I’m up to book 4 of this series and am keen to get to book 5, Blood Money, which came out earlier this year.